Willie G. Harris’ research focus has been on environmental issues in Florida that are influenced by soils and sediment components and basic soil genetic processes, including those involved in the formation of spodosols, the dominant soil order of Florida. With funding from the U.S. Department of Agriculture, Harris has conducted two projects addressing environmental aspects of phosphate in soils. 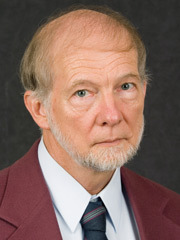 He also worked collaboratively on research pertaining to phosphorus sorption by drinking water treatment residuals; lead transformations in contaminated soils; efficacy and consequence of protocols to stabilize lead using phosphates; fluidized-bed recovery of phosphate from flushed dairy manure; mineralogical nature of Okeechobee sediment as it relates to turbidity; and forms of particulate phosphorus in water moving from the Everglades agricultural area. Harris has recently served as principal investigator and co-principal investigator on two state-funded projects involving phosphorus behavior in sandy soils. He also contributed to the planning, development and implementation of the Florida “Phosphorus Index,” a tool for use in nutrient management and assessment of environmental risks. Harris has served over the last 5 years as advisor for seven graduate students, on committees of 34 other students from six departments, and as a UF University Scholars Program student advisor. He was recognized by the soil and water science department graduate students as “Outstanding Teacher/Advisor of the Year in 2003″; as co-advisor of the Ph.D. student recipient of the 2005 IFAS Award of Excellence for Graduate Research; and as the 2004-2005 CALS Graduate Teacher/Advisor of the Year. “My goals over the next five years, are to promote interdisciplinary environmental research in Florida and to continue studying soil mechanisms involved in subsurface carbon accumulation,” says Harris, who is a Fellow of the Soil Science Society of America. “Dr. Harris’s research and teaching contributions during his 20 years clearly put him in the ranks of world-class scientist and educator,” says K. R. Reddy, chair of the soil and water science department.